It’s officially leggings, boots and sweater weather so today is the perfect day for the DC Trifecta favorite fall foods linkup. After you drool over the dishes below, check out what Courtney, Mar and Cynthia‘s favorites are as well. And don’t forget to check out Heather’s Friday Favorites. Roast Veggies – hands down my favorite food to make in the fall. Only slightly complicated by the fact that my dog has developed a major fear of the oven and whenever it’s on he cowers around the house with his tail between his legs. L Otherwise I would probably roast veggies every night. 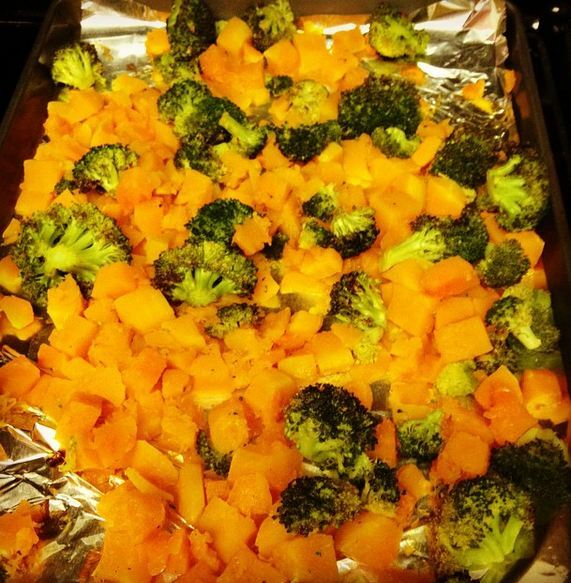 Butternut squash and broccoli or Brussel sprouts are probably my faves, but really everything is delicious when roasted with salt, pepper and a little splash of olive oil. I’ll add a squirt of maple syrup if I want to have a twinge of sweetness. Pretty much anything off of Peter’s Inn’s ever changing seasonal menu – like this week they have braised pork shank with greens and cheese grits or seared scallops with pumpkin risotto. Both sound amazing and like the perfect fall comfort foods. 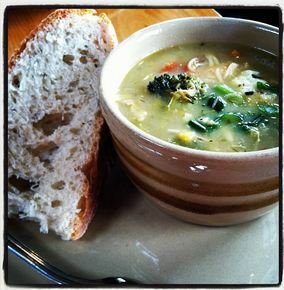 Soup – of any and all kinds. This summer I got hooked on half and half crab soup – half the red Maryland crab and half cream of crab, sharing a bowl in perfect harmony – and last weekend I had a delicious bowl at Plug Ugly’s in Canton. I’ve already raved about Atwater’s soups and their’s a new ramen place in Federal Hill that is a great addition to the neighborhood. All apple everything – apple cider, apple pie, caramel apple thumbprint scone at Panera (approximately 8 million calories but just so good). 5. Easy one pan meals – like this creation sort of inspired by Tuscan Skillet White Bean Chicken. 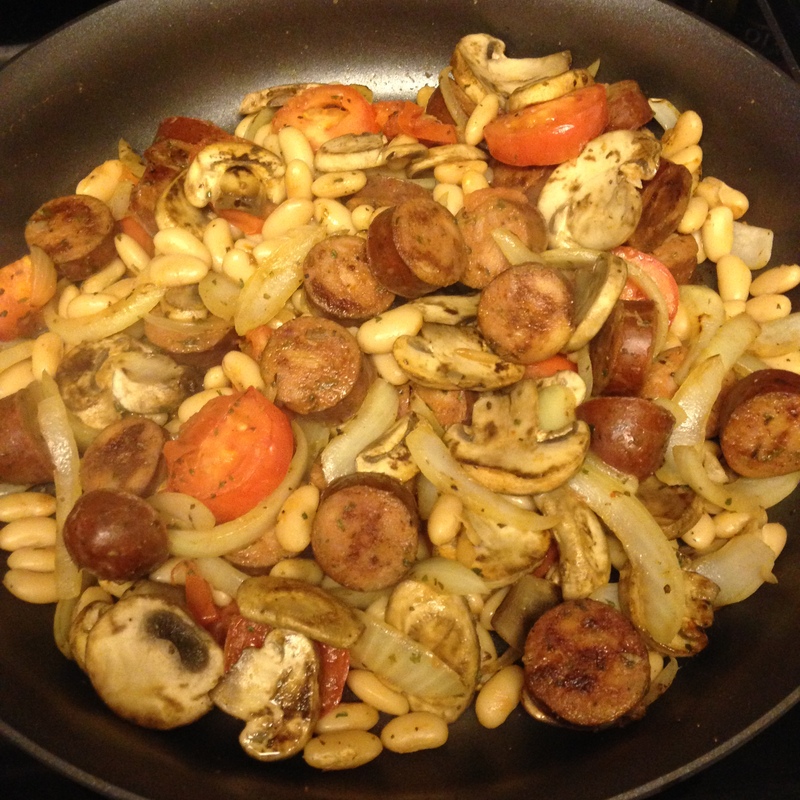 Onions, mushrooms, white beans, tomato, spicy chicken sausage + seasoning (salt, pepper, garlic, thyme, oregano). Easy, tasty and filling = the perfect fall meal. That crab soup sounds tasty. I love soup but only feel like I eat it in the cooler mths. one pot meals are THE BEST! have a great weekend!